“Aam Aadmi sota hua sher hai…Ungli mat kar, Jaag gaya to chir faad dega.” (Translation: The common man is like a sleeping lion, don’t finger him too hard else the lion will wake up and obliterate you!”) Is it a sheer irony that every time the TV is switched on, you hear Salman Khan roaring these lines in his upcoming movie Jai Ho? The same Salman Khan whom we saw shaking a leg in a pompous SAIFAI Mahotsav for the Chief Minister who is a goon and his father an aflatoon. The CM and his goons were ogling at Bollywood beauties in an event that was organized not far from wet, hungry and shivering Muzzafarnagar riot victims who just had tents in the name of resettlement and were possibly eating grass to stay alive! 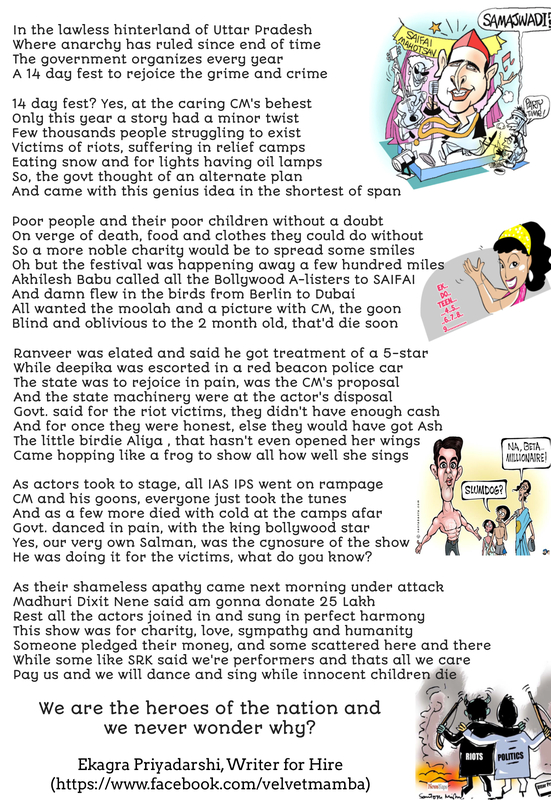 Of course, we sympathize with our victimized Bollywood A-listers who were just doing their “jobs” out there. But then again, it’s only fair that we imagined Madhuri Dixit and her ravishing thumkas and matkas, reincarnated as 2014’s Shilpa Shetty in the popular song “Main Aiye Hoon UP Bihar Lootne” (Translation: I am here to loot Uttar Pradesh & Bihar)? The goons and politicians danced to the “Ek Do Teen” tunes singing, “wah wah”! The Bollywood A-list actors were flown in private jets and driven in diamond-studded cars by the Chief Minister touted as the – Akhilesh Yadav. A mere 100 crores (umm, 16-17 million USD was it?) was squandered on the evening…other estimates are somewhere around 300 crores! Sorry for asking, “Why not something for those riot victims?” But then Akhilesh Yadav did put our audacity in place, “The liberal media should apologize to me and my daddy, yeah I said it! You wanna mess with me? We’ll let Raja Bhaiya take care of you all in his crocodile pool!” If you’re wondering what’s happening with the thousands of riot victims who were forced out of their homes and villages, faced numerous raids, murders and rapes, here’s the answer – NO ONE CARES! On a lighter note! We are just happy to witness the cosmic event of the century “ Karan and Arjun ka Milap!” Bollywood Bhadshah Sharukh Khan who, for the right price, can entertain guests at anyone’s wedding, was first in supporting his “friend-turn-enemy- turn- friend- turn- enemy” Salman Khan. The Khan brothers separated because of ego-wars were brought together as they sneered together at the misery of the hungry, naked, cold and plain needy riot victims, who by the way had already been royally f**** by Netaji – his Highness Lord Mulayam Singh himself! But again who cares? As his minister Narad Rai stated, “Deaths of children, adults and elderly are inevitable. It isn’t necessary that only those living in camps are dying. People die in palaces too. It isn’t that children in our homes don’t die. Deaths occur everywhere.” Phew! Lastly, we share with you a brilliant poem by Ekagra Priyadarshi, a wonderful writer who sarcastically pens his thoughts about the matter! Previous Previous post: Follow Vida Manejo on Bloglovin!